← What Kind of Aquatic Wildlife Will I See in Alaska? Temperate Rainforest – While not something commonly associated with the frozen climate of Alaska, it is possible for plants and animals to survive and thrive in arctic conditions. Huge volumes of annual rainfall fuel the plants growth, which then provide shelter and nourishment to support many different species of wildlife, some of which are unique to the arctic region. While many envision Alaska to be a country of white, parts of Alaska are indeed a rich and fertile green; from the tops of trees to the forest floor, and even the trunks of the trees, coated with lichens and mosses. 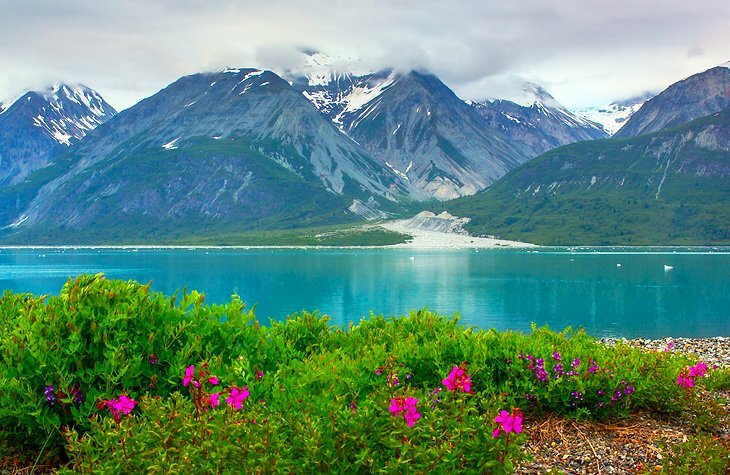 Travelers visiting in the summer are often taken aback by the vibrant hues of purple, pink, and yellow flowers that flourish throughout the Alaskan landscape. Glaciers – As one might imagine, one of the highlights of visiting Glacier Bay is, in fact, the glaciers. There are 16 different active tidewater glaciers in Glacier Bay, some of which are more than a mile long and stretch on as far as the eye can see. One of the most remarkable surprises of these glaciers is the spectrum of blues, pinks, and even yellow reflections dancing across the surface of these glaciers. Fjords are long, narrow valleys in the landscape filled with water from the sea. They provide a navigable network of waterways throughout Glacier Bay Park and offer travelers a perfect way to experience the mountains, glaciers, and other natural elements that make up Glacier Bay. The waters here are crystal clear and still, forming near-perfect natural reflections of the landscapes, as well as providing breathtakingly serene photo opportunities. The mountains in Glacier Bay are just as impressive and beautiful as the fjords and glaciers themselves, and stand tall as a remarkable backdrop for the exceptional natural features of Glacier Bay. The daring traveler might even try their hand at mountaineering in Glacier Bay, though it is not for the faint-hearted; only experienced climbers will revel in the challenges presented by the harsh climate and tricky, icy conditions. For more information on cruising to Alaska, or cruising to anywhere else in the world, call us at 1-800-565-2784, or visit us on Facebook. This entry was posted in Alaska Cruises, Alaska Cruisetour and tagged alaska cruise experts, Cruise Experts Travel, fjords, Glacier Bay, glaciers, mountain range, national park, temperate rainforest, UNESCO. Bookmark the permalink.